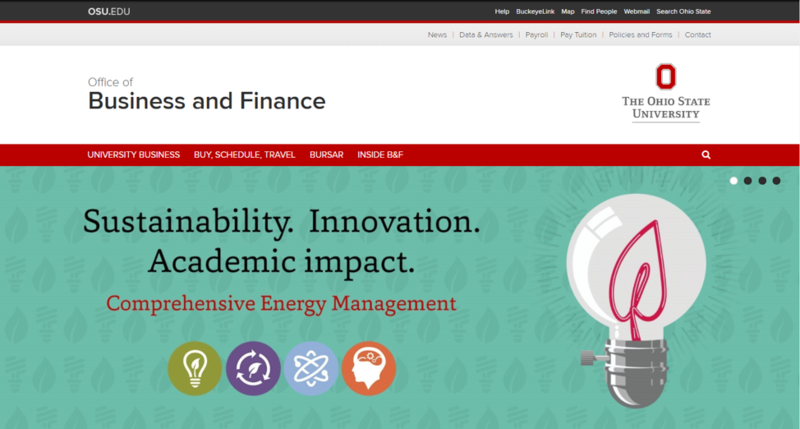 The new Business and Finance website is the consolidated home for our websites, offering a user-friendly and mobile-friendly experience. Buy, Schedule, Travel includes the service areas for a broader group of university users. These include Travel, Payroll and Purchasing, among others. Bursar stands alone to serve students. (BuckeyeLink remains the preferred front door but we have made it easy for students to navigate if they find their way to B&F). Inside B&F includes both information about B&F and service centers for our employees and affiliated groups. Browse by department. When you hover over the menu items in the red navigation bar, you will see the departments located under each. Site-wide search. The magnifying glass at the right side of the red bar allows you to type keywords to find what you are looking for. As with all search, the more general your search, the more results you will get. Quick links to resources: The gray bar atop the page includes links to resources such as Policies and Forms, News, and Data & Answers. This section includes FAQs, quick links to the annual report and operating budget, and a data center. Questions? Email communications director Rob Messinger: messinger.18@osu.edu.